The Brother DCP 150C printer is designed to fulfill your basic printing requirements. This is a colour inkjet printer with a scanner. This budget printer produces great printouts using Brother DCP 150C ink cartridges for black and white as well as colour prints and is good for home or small offices. The printer comes in a cream and light gray colour. It weighs about 7.2 kgs and is 398 mm in width, 360 mm in depth and 150 mm in height. (These measurements are taken with closed paper trays). The Brother DCP 150C printer has a USB port through which you can connect your PC for printing. It can be connected to the camera for direct printing of photographs using PictBridge port. Other software that come with the printer are Nuance’s PaperPort, Brother Creative Centre, Control Centre and driver software. The print head resolution is 6000 dpi (enhanced) and scan resolution is 1200 X 2400 ppi. Its paper tray can hold up to 100 sheets. A borderless print function is also present in the printer though it takes about 3 minutes to print 1 A3 colour page. The printer offers average print speed. It prints black and white pages at 3.00 ppm and colour pages in 2.96 ppm. It has a 16 character LCD display. It has a 4 cartridge printing system. The consumables include Brother DCP 150C ink cartridges which can be purchased online when required. It has an SD card reader, memory stick reader, CD flash reader, and XD card reader. 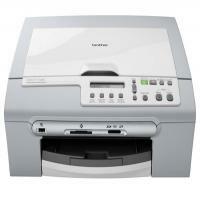 The Brother DCP 150C printer is affordable and hence works well for homes and small workplaces. The slow print speed is bothersome and the consumables are costly. The presence of PictBridge makes it easy to print photos directly from camera. How to generate a print quality check sheet for Brother DCP 150C? If you repeat this procedure at least five times and the print quality is still poor, replace the Brother DCP 150C ink cartridges for the clogged colour. After replacing the ink cartridge, check the print quality. If the problem still exists, repeat the cleaning and test print procedures for at least five times for the new Brother DCP 150C ink cartridges. If ink is still missing, call your Brother dealer. DO NOT touch the print head. Touching the print head may cause permanent damage and may void the print head's warranty. Q. I had sealed my Brother DCP 150C ink cartridges a few months back as I had to travel for business and there was no one to use the printer. I want to reinstall the cartridges in my printer now. Can you tell me how to go about it? A. Please take out your ink cartridges from the bag in which you stored them and check them carefully. Make sure there are no ink deposits at the top of the cartridges; if there are any, clean them gently with a slightly wet cloth or napkin. The cartridges should also be dry before they are reinstalled. Q. Is the average coverage of printout by compatible Brother DCP 150C ink cartridges the same as that of original ink cartridges? And is the average coverage 5%? A. Yes, the average coverage of both, which is 5%, is the same. Q. What makes the quality of images and documents printed by Brother DCP 150C ink cartridges exceptional? A. The cartridges use advanced ink formula and components that have been put through stringent quality checks. which enhance the output. Q. Does Brother DCP 150C ink cartridges yield more number of prints in black as compared to colour printouts? A. Yes, these ink cartridges print more in black than in colour. Q. Should I shake the new Brother DCP 150C ink cartridges I bought after I open up its pack? A. No, don’t shake the ink cartridges at all from side to side or in any direction. Doing that can make the ink leak from the cartridges. Q. Is the ink used in ink cartridges harmful to skin? What should I do in case it comes in contact with my skin? A. The ink used in ink cartridges should be washed off thoroughly when it contacts the skin. You’ll have to wash it thoroughly with soap and water.